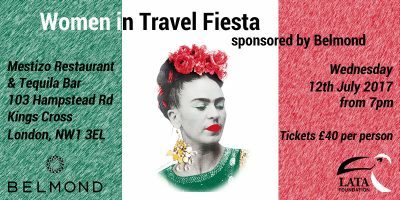 A chance to meet like-mind women from across the Latin American Travel community, while raising essential funds for grassroots projects in Latin America. We will be joined by Philippa Vernon-Powell of New Lifeline, who will share her inspirational story of the incredible work she has carried out across Central America with help from the LATA Foundation, and we will also be hosting an exciting auction. Tickets are just £40 per person, which includes your refreshments for the evening and 100% of proceeds will go to grass roots projects in Latin America. Reserve your place now as spaces are limited! ← LATA Foundation Spring Newsletter!